My first book, Higher Education Accountability, was released through Johns Hopkins University Press in 2018. The book can be ordered through JHU Press or Amazon. Colleges face pressures from all sides to improve their performance in a wide range of areas. The federal government highlights student outcomes for low-performing colleges and threatens to strip student financial aid eligibility from the worst institutions, while many state governments now tie a portion of appropriations to outcomes such as the number of students who graduate. Accrediting agencies are pushing for more resources to be devoted to particular programs, while faculty and student governments often have different priorities of their own. College rankings providers and media outlets try to shape colleges’ actions to match their own preferences, which could be focused on prestige, social mobility, or ensuring free speech on campus. The web of accountability pressures can be difficult for colleges to manage, since many of these pressures can be pulling them in different directions. For example, college rankings systems that reward universities for being as selective and prestigious as possible conflict with state performance-based funding systems that pay colleges for each student who graduates. Colleges then have to prioritize which pressure is more important to them and respond accordingly—or try to find a way to game the metric in a way that lets them have their cake and eat it, too. Although there has been quite a bit of research on how colleges have responded to individual accountability pressures, these studies generally do not account for how colleges must respond to a number of different pressures at the same time. This means that policies that should be effective when viewed in isolation may be completely ineffective when examined alongside the competing pressures that colleges face. Additionally, policymakers seeking information about designing accountability systems and colleges trying to figure out how to respond have had to read across multiple bodies of literature in order to understand the landscape of higher education accountability. I wrote Higher Education Accountability with the goal of summarizing what is known about accountability in American higher education, while also drawing in lessons learned from accountability systems in other nonprofit and public-sector organizations such as K-12 education, health care, and public management. This book drew upon my experience as an economist of higher education who has conducted empirical analyses on how colleges respond to individual pressures, a researcher who has been involved in a range of public policy discussions, and a person who manages a private-sector accountability system (Washington Monthly magazine’s annual college rankings). The book begins with the key theories underlying higher education accountability policies and practices in Chapter 1 before moving to the historical development of accountability in the United States prior to the passage of the Higher Education Act of 1965 in Chapter 2. In the next five chapters, I detail how five different groups seek to hold colleges accountable for their actions (and the extent to which these efforts are effective). Chapter 3 focuses on federal accountability, Chapter 4 on state accountability, Chapter 5 on accrediting agencies, Chapter 6 on private-sector endeavors (with a particular focus on college rankings and ratings), and Chapter 7 on efforts by students, faculty, and staff to change institutional priorities. 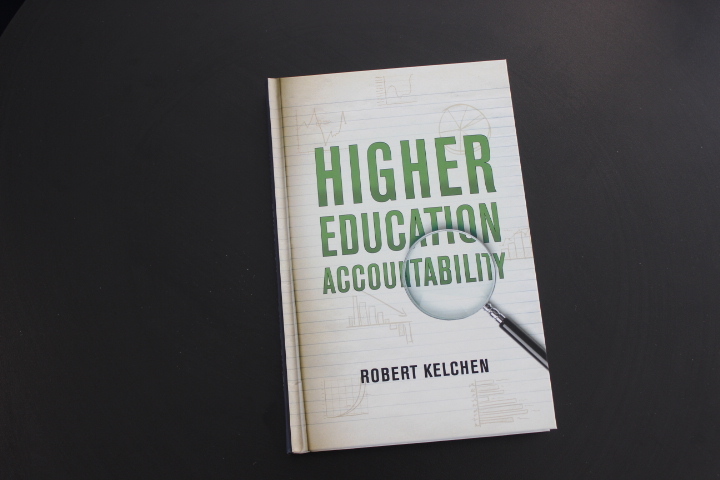 Chapter 8 outlines ten lessons learned from accountability efforts, and I conclude in Chapter 9 by highlighting five key questions that will influence the future of higher education accountability. Higher Education Accountability is designed for policymakers, higher education professionals, students and faculty, or members of the public who are interested in learning more about how colleges are responding to all of the pressures that they face. I hope readers enjoy the book, and I welcome comments from readers!